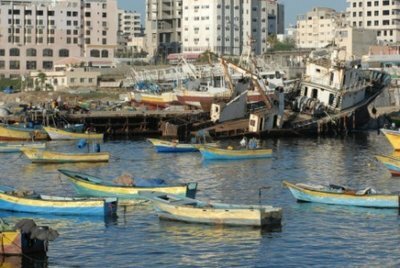 Sami Jamil Jadallah – The Hell with Israel, Open the Sea Port of Gaza! The Gaza donor conference concluded a couple of days ago in the Egyptian city of Sharm-El-Sheik and was attended by more than 70 countries, pledging more than $5 Billion, exceeding any and all expectations. Of course this sum of money and the US pledge of $300 million is dwarfed by the $30 Billion George Bush pledged to Israel in arms and weapons. Nevertheless, I think the attendance and the generous amounts contributed shows finally how much the world cares about the people of Gaza and is an indirect indictment of the crimes committed by Israel during its 22 days of 24/7 assault on the Gaza Strip. Of course very few heads of states or government officials dare to criticize Israel as it went ahead with its war crimes on Gaza, but the world rallied around to bandage the wounds of the more than 1.5 million Palestinians who had to endure the most criminal war assault since the closing days of WWII perhaps with the exception of Israel’s summer war on Lebanon a couple of years ago when some 1.5 million cluster bombs, gift from George Bush to the Lebanese people, were dropped in the last 10 days of the war. The Gaza Reconstruction Conference in its closing statement called on Israel to open with immediate effect all crossings for all humanitarian aids and for conareuction materials needed for the massive work ahead. Somehow everyone forgot the geography of Gaza and that Gaza has some 50 km of shoreline and has a sea port. However Israel, given the angry unhappy nation it is, full of hate and contempt for the world and human values, is a country that will not even consider world opinion because it does not give a damn about the world public opinion to begin with, and is unlikely to open the border crossing with Gaza for pasta, let alone a front loader. The newspapers carried accounts of the secret list of forbidden or restricted items Israel concluded as threats to its own security including “pasta, pasta sauce, lentil and hearing aids”. Senator John Kerry, the Chairman of the Senate Foreign Relation Committee had to inquire with Ehud Barak, Israel’s Defense Minister why “pasta” is a restricted item? This should tell you and the world how pitiful this nation is, “the only killing democracy in the Middle East” and I will not be surprised if Israel added Humus, fool, falafel and kinafeh to the list of forbidden items. One has to imagine if the Palestinians want to import heavy construction material or cement. Perhaps Israel has new building technology made up of bagels, motzaballs or corn beef as construction material. Israel needs serious mental help. What I am most surprised about is the call by almost everyone, from Mahmoud Abbas, to Hillary Clinton, to Nicolas Sarkozy, to Husni Mubarak and their calls, almost begging calls for Israel to open the border crossing, I say, the hell with Israel and its border crossing with Gaza. Let Israel build a 1000 meter high Apartheid Wall between it and Gaza. Who needs Israel and who needs its products and services? Israel is giving the impression to the world it is doing the Palestinians a big favor when it allows fuels and food supplies to come into Gaza, For Gods sake Israel and Jewish suppliers get paid for everything that comes through to Gaza, at much higher prices, nothing is for free, so why bother with Israel when Gaza has access to the sea and has a port much older than any ports in Israel? Let Israel go to hell, and let Israel keep its border crossings closed and let the people of Gaza open their port and import everything they need and want through the Port of Gaza. No need to reward Israeli suppliers with billions of supply contracts. I know the world is concerned about Hamas smuggling weapons, and all I can say is that Hamas is simply too stupid to smuggle anything of significant threat to Israel such at RPJs and other serious weapons of significant risk to Israel. In more than 2 years under siege Hamas has managed to smuggle enough material to produce useless, and militarily insignificant Qassam rockets that some 15,000 of these failed to even totally destroy one single house. Though I believe the issue of weapon smuggling is more political and a powerful propaganda tool than a strategic issue for Israel, nevertheless I concede that something has to be done to make sure that Hamas or anyone else does not use the opening of the Port of Gaza for weapons smuggling. Besides, I am not convinced that armed struggle Hamas style is the answer to liberation. I am sure the Americans and the Europeans will be very pleased if Mahmoud Abbas and Hamas announced to the world their willingness to entrust the management and operation including security operation of the Port of Gaza to the Americans and perhaps some European partners. Let America manage and operate the port making sure only constructions materials, food suppliers and consumers goods comes through the port. Let Americans and the Europeans break the siege of Gaza and end once and for all the Israeli Occupation of Gaza that has lasted some 42 years. Let America and Europe operate all of the security measures, not to Israel’s satisfaction but to the American and European satisfaction that all materials coming through are for civil purposes and nothing to make atomic weapons out of. And yes, let Egypt close the Rafah Crossing for all goods but allow it for people to cross if they choose to travel through Egypt. Let the US and Europe open and operate both the Sea Port and Airport of Gaza. Let the world this time end the siege of Gaza. Hamas must not hold the people hostage to its own agenda. And yes, let the US Navy and US Coast Guard patrol the coast lines off Gaza for good measure. I think this is probably the worst article I have ever read. So full of propaganda and lies it is ridiculous. People like you should be banned from journalism. Not once do you point out that Hamas continues to fire motars at Israels for the last seven years. Not once do you mention how Hamas is targetting civilians. Not once do you mention that there were underground tunnels wide enough to drive trucks from Egypt to Gaza. You are a propagandist and a racist for not presenting balanced picture of the conflict. Its people like you who perpetuate the conflict. Instead of portraying an accurate picture of reality you make one side so fanatical peace will never have a chance. Yes, of course, I have to be fair to the Israelis. Poor Israelis, they suffered great deal from Qassam Ballistic and Nuclear missiles. Over 5,000 of these useless and reckless missiles fired by Hamas toward Southern Israeli towns creating big damage and causing irreparable harm. Two Israelis are know to die from these powerful missiles, few homes partially destroyed, otherwise the Israeli residence were having difficult time enjoying their dinner with music and wine. Across the border in besieged Gaza, more than 1.5 millions are left without lights, food, gas, cooking oil with hospitals putting at risk hundreds of patients because of lack of power. People are unable to bake bread or cook food, or have heat or gasoline for emergency purposes. Dozens of people died because of lack of medications and access to emergency services. Dozens of people were killed by Israeli tanks and Israeli gun boats, including a family killed at it was enjoying quite afternoon at sea side. Meanwhile across the borders on the West Bank, some 80,000 Palestinians in Hebron have to live life under daily curfew so that some 400 Jewish Settlers can enjoy themselves, dance on the streets, and throw garbage at Palestinian homes and residence and evict them from their own homes. More than 2.5 millions have to face cruel humiliations and a daily life going through some 500 security checkpoints where a 10 minutes distance is turned into a day long affairs, where pregnant women died while waiting to get permission to go to hospitals. More than 300,000 olive trees where uprooted to make room for Jewish Only Road, and to make room for settlements built on stolen Palestinian properties, including mine. Tens of thousands of Palestinians lost their residency in Jerusalem simply because they are Palestinians, part of the deliberate ethnic cleansing of Jerusalem of its Arab citizens. Thousands of thousands of homes were destroyed because Israel claims the people did not have permits to build and where a Palestinian have to wait for 15 years to get a permit to build an addition to his house for his newly married son, while Jewish settlers are given permission to build tens of thousands of homes as a matter of public policies and build them on land they do not own. Yes, of course poor Israelis they are suffering a great deal living under Palestinian Occupation and living under the threat of Hamas rockets. Perhaps the Israelis like to exchange position with the Palestinians not for one week, or 42 years but for one day. Yes, I am unfair to Israel and its occupation, and yes, I did not mention the Wall and its impact on the daily lives of people and farmers. I also did not mention the fact that entire Arab towns do not have daily access to drinking water so that Jewish settlers can have green and healthy lawns and can enjoy their swimming pools. Yes, poor Israelis they really have it rough, and again, I apologize for not being fair to Israel and its occupation. It must be part of my genetic trait as an Arab. The lack of a sense of proportion is probably the most atrocious thing that jumps to the eye. then… as you say, we go to the West Bank and compare it to the Israelis. It would make for accurate information. At this point, though, Israel would need to go for the only tool they know – lies and propaganda. The truth is not on their side! Well, I have to say “my cousin” has lots of Chutzpah and having lived and worked with my cousins, I learned it too. May I suggest to “my cousin” who accused me of being unfair, unbalanced and an idiot, I suggest this. Let Hamas have all of the weapons at the disposal of the Israeli Army including all of the F-16s. F-15s. Drones, Apache and Cobra Helicopters, Armored Personal Carriers, Tanks, 155 mm Howitzers and all of the gun boats and I say, let Israel have 1,000,000 Qassam rockets and have all of the tunnels with Egypt. I would say this will be a fair trade and will be balance since there is complete substitutions and exchange of roles and equipment of the two groups. And yes, let Gaza becomes Sderot and Ashkelon and let Sderot and Ashkelon become Gaza. Not for five years but for 3 weeks or 22 days to be exact. That will be a fair trade and a fair balance of terror. I am sure “my cousin”, smart, fair and balance he is, will not object to that. This reminds of Eddy Murphy movie “trading places”. Very funny movie indeed. Shalom/Peace/Salam. Thank you Emily for your compliments. I was hoping you have the smart and intelligence to write your own words rather than using the same language and text as that of Sdfd. I take your advice under consideration and in my next posting I will give Israel full exposure as the “only democracy” in the Middle East, and will give its very efficient army my compliment. Yes, indeed, Israel is a light unto other nations, except this light comes in the form of phosphorous and cluster bombs. I do think that G-d made a big mistake; He/She must have been too desperate. the comment on 1 and 5 is very funny – this article is in fact among the most “balanced” and pragmatic on this site (it is, of course, pro-Palestinian – being on PTT, it seems normal one should care about Palestine -, but it is rather critical towards Hamas’s strategy and open to an American/ European control of the port). So maybe the fact that it is “balanced” is more upsetting to an Israeli eye; given that the Israeli hypocritical propaganda is “we love the Palestinians, but hate Hamas”, it perhaps finds itself uncovered faced to a position that states: Palestine comes first. Eventually, the comment reads “You are a propagandist and a racist for not presenting balanced picture of the conflict”, but the purpose of the article is not to present the conflict – the conflict has made itself evident to the whole world through the slaughter in Gaza – but to propose a solution. But obviously the Israeli politics has never sought a solution to the conflict; on the contrary, it has always tried to: 1. present to the world the biased image of the conflict and at the same time make sure that it is accepted by everybody just like anything related to Israel, and 2. get rid of the Palestinian term of the problem instead of trying to solve the conflict. Whatever one thinks of Hamas’ strategy, it is unacceptable imperialist chauvinism to support an arms embargo against Hamas while Israel continues to import, manufacture, use and export far more powerful weapons than any Palestinian faction could hope to obtain. Moreover, Hamas and other anti-imperialist factions need weapons to deal with U.S./Israeli-owned Quislings like Abbas and Dahlen. And inviting the U.S. to have any more presence in that region than it already has is a crime against present victims of U.S. imperialism (Iraq, Somalia, Afghanistan, Pakistan, etc.) as well as future victims. BTW, if Hezbollah hadn’t had Iran weapons, could they, despite their skill and dedication, have resisted Israel as well as they did?